University of California Press, Berkeley. ISBN 978-0520271548. It would be very easy for a visitor to Rome to come away with the impression that the local menu consists of little more than the Gang of Four pastas (carbonara, amatriciana, cacio e pepe, and gricia) plus carciofi alla giudia and a great deal of offal. But there is so much more! So many vegetables, fresh- and saltwater fish, all those delicious legumes and pastas! The stewed oxtail! Crostata with sour cherries! Supplì al telefono! The nearly 200 pages of authentic, traditional recipes in this book should set the record straight. And yet recipes are only a part of the book. 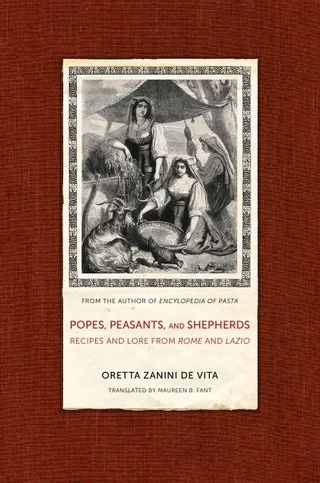 Oretta tells the story of Rome and its region, Lazio, through aspects of its food and drink, showing how interwoven are food and politics, food and religion, and food and geography. There are chapters on water, mills, sheep, roads and taverns, Carnival, the Jewish kitchen, the Papal table, fairs and markets, Hollywood on the Tiber, sweets, and olives, as well as chapters on the five main geographic areas of the region—Viterbo and Etruria, the Sabine country, the hills and mountains east of Rome, and the Tyrrhenian coast. It's an easy, lively read (with plenty of footnotes for those so inclined), and the recipes are quite easy to follow, even though, admittedly, you may not want to follow all of them. Frog frittata, anyone?